Everyone wants their wedding to be perfect, from the venue to the ceremony to the reception, food, etc. Are you starting to plan your wedding but still not sure about the location? Why not Lake Tahoe? Situated in Northern California among the Sierra Nevada Mountains, this is one of the most beautiful wedding destinations in the world. 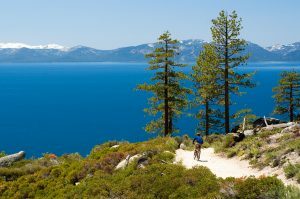 Couples from across the globe come to the Tahoe area to exchange vows among the natural beauty that surrounds this part of North America. If you are getting married, you should definitely consider a Tahoe wedding. What makes the Tahoe area so ideal for a wedding? Apart from the natural beauty all around, you can pick from a diverse range of locations. You can have an Emerald Bay wedding, a mountaintop event or even a beach wedding. The area also has a number of little chapels that are perfect for a pretty, unforgettable wedding. Plus, the Tahoe area is beautiful all year round, so you can have your dream wedding any time of the year. Planning a wedding is not easy and there are a lot of details you need to take care of. We are professional wedding planners who organize amazing Lake Tahoe weddings to fit every size and budget. As a team of professionals who understand the importance of your special day and making sure that it is perfect, we will take care of every detail to make sure that you and your loved ones have a fantastic time. Whether it is small Lake Tahoe weddings or large weddings with hundreds of guests, you can trust us to make sure that everything goes smoothly and all your guests have an unforgettable time. We specialize in planning weddings to satisfy every need. We will even plan if you want to elope in Lake Tahoe! You can always rely on us to help you plan and organize the wedding of your dreams. For the most romantic and memorable wedding, choose Lake Tahoe. You can choose from Tahoe lakefront weddings or mountaintop weddings and have that special day everyone wishes for. There is no better place in the world than the Tahoe area to exchange vows and begin creating your memories as a couple. Get hitched in Lake Tahoe with our help and have a beautiful beginning to the new phase of your life with your significant other.